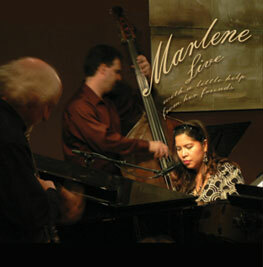 Marlene's latest CD on Blue Earth Music, Marlene LIVE With a Little Help From Her Friends. Marlene del Rosario on vocals/piano. Also featuring Greg Hopkins on trumpet, Patrick Mottaz on guitar, Dave Landoni on bass and Brooke Sofferman on drums. About the musicians and project.